Charles Faulkner reveals the concept of "meaningful influence" and why it is really the only kind of influence you will ever need to know about. You will learn how to influence more effectively and obtain more of what you really want. All you have to do is apply this knowledge and make meaningful influence the magic that transforms your life! Experience "meaningful influence" and learn how to use it to get what you really want by helping others to get what they really want! Influence. What does that word mean to you? What images come to mind? Whatever it means to you, or you imagine it means, could you accomplish anything in life without it? Imagine yourself without influence and you quickly realize that it is one of the most important skills you can learn. Whether it's in business or at home, influence is how we make things happen and move ourselves forward. Influence is how we achieve what we want. Whatever way you think about it, you want to be able to influence others. Now, Nightingale-Conant is proud to present a new kind of influence that allows you to notice what is really important to you and those you want to influence so that both of you can truly begin to live life to the fullest. 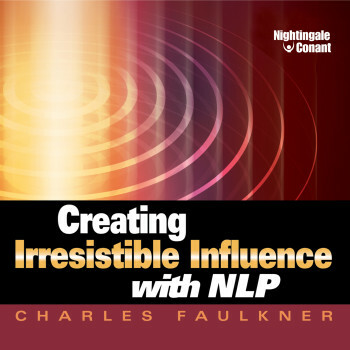 In this paradigm-changing audio program, Creating Irresistible Influence with NLP, author and NLP modeler Charles Faulkner reveals the concept of "meaningful influence" and why it is really the only kind of influence you will ever need to know about. You see, influence only happens when something means something. Meaning is what engages us. Meaning is what makes us emotional. Meaning is what lets us know what we're all about. What is meaningful to us is what really matters. And as we know, everyone takes action when it comes to what really matters. In this program, you will learn how you can substantially increase your influence by interacting with others in more meaningful ways. And doing this doesn't mean pretending anything. In fact, you will get to be more of who you are as you encourage others to express more of who they are. The crucial difference between influence and manipulation. How to hear (and see) what people really want. How to increase your influence through a Value Matrix. Five ways every one of us makes something more meaningful. The importance of Identity Values over Utility Values. The five levels of the Pyramid of Influence. How everyday metaphors shape our identities and businesses. The Five Life Purposes that drive all of us. How the stories we tell about ourselves lead to our futures. With Creating Irresistible Influence with NLP, you can open up an exciting new dimension in your life. One that can make life a more fulfilling adventure than you have ever imagined. All you have to do is apply this knowledge and make meaningful influence the magic that transforms your life!